After enriching minds and making a difference in the lives of young people, my next favorite thing about being a teacher is tricking children. Sometimes I use trickery for good, like tricking students into thinking grammar is fun, or that reading is, in fact, not a waste of time. But sometimes, like on April 1, I use trickery for … well, trickery. I treat April Fools’ Day the way I treat my morning iced coffee: Go big or go home. Forget the old tricks like filling Oreos with toothpaste or hiding rubber bugs in students’ desks. 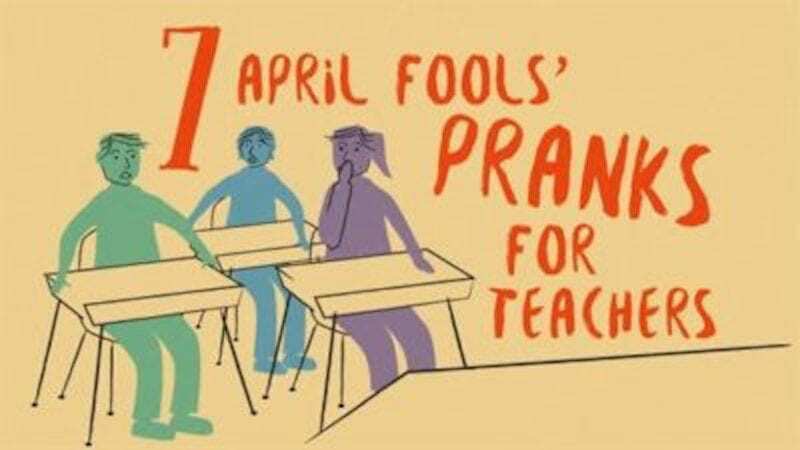 Here are seven pranks that will require a spatula, because afterward you’ll need them to scrape your students’ minds off the floor. 1. 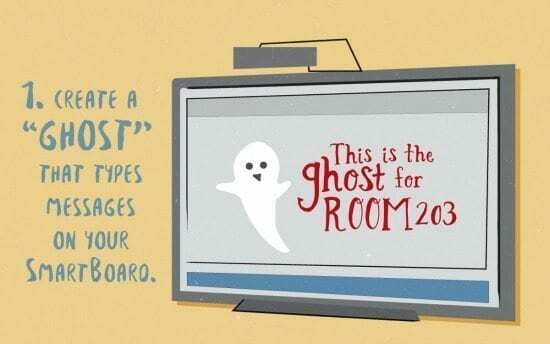 Create a “ghost” that types messages on your SMART Board. You’ll need another teacher in on this prank with you. First, get a cheap wireless mouse and keyboard (they’re on Amazon for less than $20, and they’re practical to have post-prank!). Test them to see if they will still work on your computer while being used remotely from another classroom, preferably one next door. Then, just before class starts, set up a laptop or phone in the back of the room that is Skyping with the other teacher in another location (make sure to mute the device that’s in your class). This other teacher will also have the wireless mouse and keyboard and can see and hear what’s going on in your room from the Skype session. Once class is in full swing, in the middle of your lesson, while your computer is projected on the board and you’re clearly not on your laptop, have the teacher use the wireless mouse and keyboard to pull up a blank Word or Paint document on your computer and start drawing or typing messages. It can be a friendly ghost who draws a smiley or says something like “Why do all these kids smell like Axe?” or it could be a ghost-ghost who says “THIS IS THE GHOST OF ROOM 203. GET OUT!” On second thought, maybe don’t create a ghost if you teach tiny children*. 2. 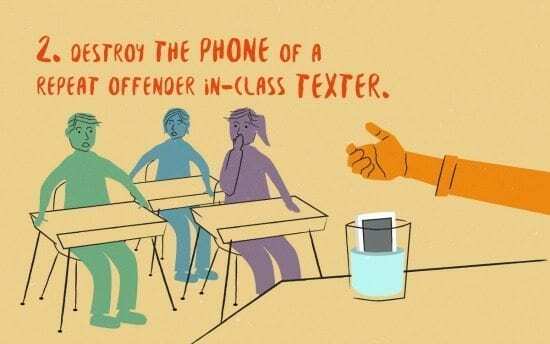 Destroy the phone of a repeat offender in-class texter. 3. Make your students think you’re in trouble with the FBI. Either download the Fake Call app or arrange for someone to call you at a certain time on April Fools’ Day. Change the contact name to something like “FBI” or “Detective Mathison” or “(City) Police Department.” At the arranged time, make sure your phone is out and in a place where one or more students would see it light up with the contact name. Then pretend to be flustered, “Oh, that was nobody—go back to work, don’t worry about it.” Then tell your students you need to make an important phone call. Go in the corner of the room and say suspicious things in a hushed but audible tone like, “Well, how can you be sure it’s me?” and “Do they have proof?” Take this prank one awesome step further by having your principal in on it by coming in 15 minutes later, saying very seriously that you need to come with her NOW. Leave for 30 seconds or just long enough for their heads to explode. 4. Send lots of well-behaved students to the office. Tell a group of students ahead of time that you’re going to pretend to get mad at them for something very small and send them “to the office,” but tell them to hang out around the corner. Then before the period starts, tell your whole class you didn’t sleep well and to not mess with you. Start sending people in your group to the office for things like breathing too loud or looking at the clock. 5. 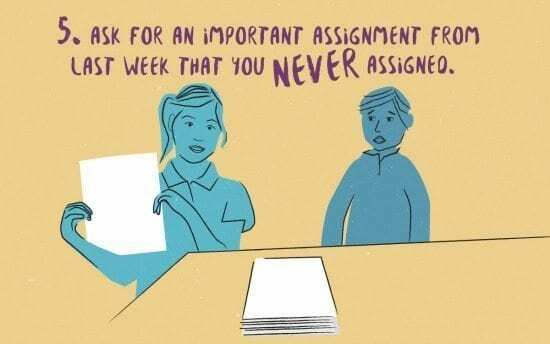 Ask for an important assignment from last week that you never assigned. Now, this is an oldie, but if it’s done right, it will never get old. Have anywhere from half to almost all of your students in on the prank, and sometime before class, give them a copy of a printed, multi-page essay with their name on it. Then during class on April Fools’, stop what you’re doing and exclaim, “Oh my gosh, I completely forgot. I need you to turn in your essays from last week right now—I need to get those grades in tonight before the grading period ends.” The kids who aren’t in on the prank will pipe up, “What?! You never assigned that!” You might even have someone say, “No way—this is an April Fools’ joke.” But then you can say, “Then why do I have half the class turning in a typed paper right now?” When the prankees see everyone who has the assignment backing you up, they will go ballistic. 7. 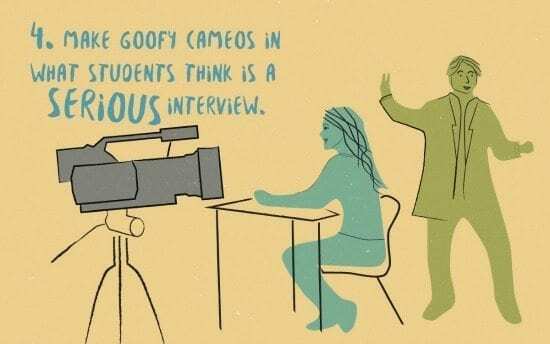 Make goofy cameos in what students think is a serious interview. 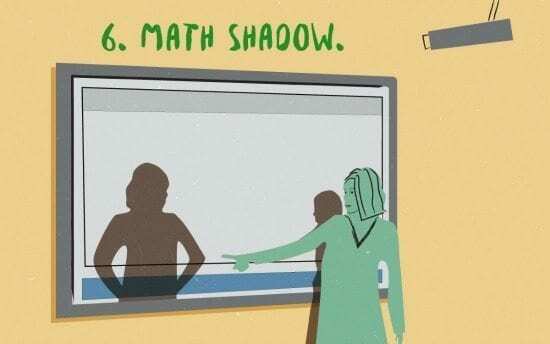 In the weeks before April Fools’, tell your students they are going to be individually interviewed for a district video where they’ll be asked serious questions about standardized testing, college loans or other important issues. As the student interviews, have another teacher behind him or her dancing or making ridiculous faces (make sure the interviewer doesn’t laugh or look behind the student!). On April Fools’ Day, tell your students they finally sent out the district video, and show your students a reel of all of them getting videobombed. What prank (or pranks) are you going to use this year? *Or larger children who are afraid of ghosts, which is me at age 28. Do you still play pranks when school doesn’t land exactly on April 1st?